For the first twelve hours of the ride (race, it’s a race, Chappell), I barely stopped smiling. Because, after all, cycling along quiet roads through the cool night air, with no human company beyond some occasional twinkling red lights ahead of me, is one of the things I love most in the world. Within a few minutes of leaving Geraardsbergen I was almost completely alone, though I suspected there must be other riders all around me, just out of sight – if we all continued at the same pace, we wouldn’t meet until one of us stopped, and the others caught up. I wondered ever so briefly whether the pink line I was dutifully following on my Garmin was leading me in the right direction, but the compass in the corner of the screen pointed directly towards me, meaning that behind me was north, ahead of me was south, and if I carried on riding in that direction I couldn’t go far wrong. And now and again I’d pass another rider, or one would pass me, usually with a smile and a wave, and we’d both know we were on the right track. So far the race felt exactly like the many night rides I’ve done down to Brighton or out to Dunwich – the smooth lanes, the fragrant hedgerows, the silent villages – the difference being that this night ride would turn into a morning ride, and an afternoon ride, and another night ride, and another, and the gentle countryside of Northern Europe would eventually give way to the jagged Alps, and the hellish heat of the Balkans, and ferocious dogs of Turkey and Bulgaria, and whatever other horrors we hadn’t yet been able to imagine. But I didn’t need to imagine all of that – it would become a reality soon enough. I was determined to enjoy the first couple of days – and to get in as many miles as I could while the weather was still cool, knowing that for most of the race I’d be riding at temperatures far higher than I’d normally choose to inflict on myself. We had been warned it would rain, and sure enough, an hour or so into the ride I was hit by a few brief flurries, while lightening flickered ominously on the horizon. It was at about this point that I followed my Garmin down a narrow lane that rapidly deteriorated into gravel, and then abruptly switched to cobbles. My dismay was only momentary. In the UK such a road would almost invariably lead to a remote farmhouse (with an angry dog), or simply disappear into a ploughed field, but I knew this must be one of the legendary cobbled roads of Belgium, and that it would lead somewhere, and that even if it didn’t, I had all the time in the world to extricate myself because, really, I didn’t stand a chance of winning this race, or even doing particularly well, so I might as well do a bit of exploring along the way. My front beam lit up the uneven pavé ahead of me, and the brambles and stinging nettles crowded in from both sides, at some points brushing against my legs as I steered myself round a pothole or a particularly sandy bit of gravel. I wanted to stop for a moment, to savour the silence that would crowd in as my wheels stilled and my breathing slowed, to enjoy the sense of being cradled by the hedgerows, here in this tiny lane, somewhere on the earth’s surface with the flickering sky above me and no one watching, but I was here to ride, and so I rode on. Eventually the lane turned back onto a main road and almost immediately I began passing other riders again – it looked as though the pack had split shortly after leaving Geraardsbergen, taking two different routes south that were now converging. Ultan overtook me with a cheery wave. ‘What a nice young man’ I thought, as he raced off into the night on his futuristic time trial machine. “See you there!” I shouted at his back. I stopped briefly to rearrange the contents of my frame pack, which had begun to chafe my calves with every pedal stroke (it’s been pointed out to me that this may have more to do with the girth of my calves than the size of the frame pack), and every rider who passed me called out to check whether I was OK. (Pointless, now I come to think of it, since the ‘self-supported’ ethos of the race would mean instant disqualification for anyone who tried to help – but not even Mike Hall can legislate against camaraderie, and neither would he want to.) After a short while a voice said “hello love!” and Juliana zoomed past me. 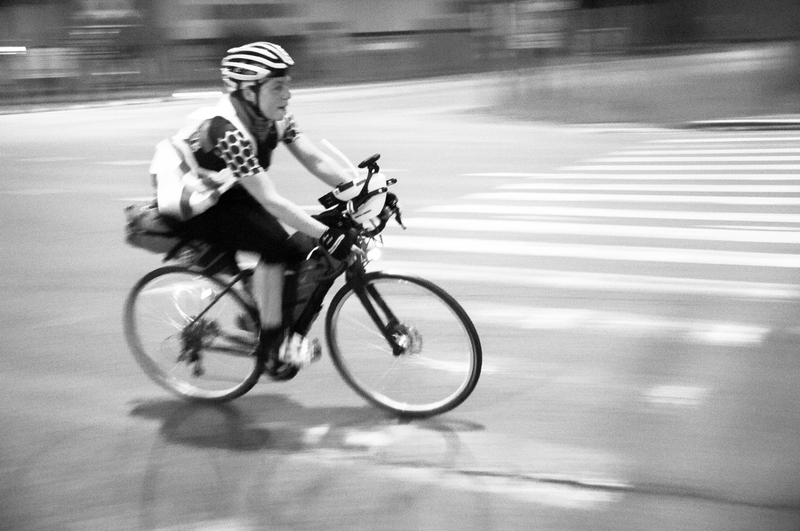 I chased her for a mile or so, but she was riding harder than I’d ever seen her ride before, and far too fast for me to keep up with. ‘What a shame’, I thought, having hoped that our paths might cross at more length along the way – that we might ride alongside each other for a while, or that I might spot her bike parked outside a café somewhere in Italy, or even that I might reel her in and overtake her on one of the long climbs. It could still happen, I reminded myself. Who was to say how either of us might speed up or slow down over 4,500km? She might be held up by a mechanical; I might get into my stride and pick up the pace on day 4; I might make an unplanned detour and fall behind again; she might have a burst of insomnia and keep going for three days straight. But watching her disappear into the night, I doubted that I’d see her again. I had thought I was on good form, but she was in another league. I still had a long way to go. Soon we were into France and, as the sky gradually faded from black to blue to grey, the wind picked up and the rain came down – or rather, across. We found ourselves crossing a vast and empty region of rolling yellow wheat fields, with not even a hedge to break the monotony – or the wind, which roared in from the west, driving the rain like bullets into our bare faces and legs, and occasionally elbowing us out into the road. This appeared to be the only obvious route south, and the riders had settled into a long, loose, strung-out pack, one or two usually visible ahead of me as I crested the hills. A few pairs passed me, efficiently slipstreaming each other, and I fell into my usual rhythm of overtaking the men on the climbs, and being overtaken in turn on the descents. Not everyone was enjoying themselves as much as I was. A few of our passing exchanges focused exclusively on the unpleasantness of the weather and the hardship of riding through the night, and I had already seen one or two riders asleep by the side of the road; one curled up at the edge of some dripping woodland, another huddled between two haystacks that stood like twin skyscrapers at the crest of a hill, and were the only windbreak for miles around. And as the day set in, so did the hunger. Despite my three dinners, I had already finished off most of the snacks I was carrying in my fuel pods and jersey pockets, and was reluctant to break my flow by stopping to rummage in my seatpack for the tray of Tesco flapjacks I’d bought on the way to Dover. It was a mild shock, as it often is on overnight rides, to realise that it was still before seven – having already spent so long in the saddle and watched dawn break, I felt like I was already well into the day. The quiet acres of wheat continued to undulate on either side of me, and I started to wonder how long it would take me to get to the next village, and whether there’d be a boulangerie open when I did. A few minutes later I rolled into a small wet town, whose name now escapes me, and as I rode past the main square, I spotted a lit-up shop window at one end (and furthermore a couple of bikes parked outside) and knew that it was breakfast time. The wind calmed down as the day wore on, and I left the wheatfields behind me for a frustrating hour getting lost in Reims (and noticing only as I got off the bike to carry it down a flight of steps onto the road I was supposed to be on that my tracker had already managed to saw through its zip ties and was hanging on by a thread), and then a delightful afternoon of following my Garmin’s eccentric route along broad gravel roads that cut straight across the fields under acres of rolling cloud. Here and there tyre tracks told me that someone else’s Garmin had had the same idea, though I had no idea how long it was since they’d passed that way. I had attempted to check the tracker on my phone during a brief stop at Macdonalds in Reims for third breakfast (or possibly first lunch), but had only just managed to locate my dot when the page crashed, and I stopped bothering after that. So I had no idea of where I was in relation to the rest of the pack. 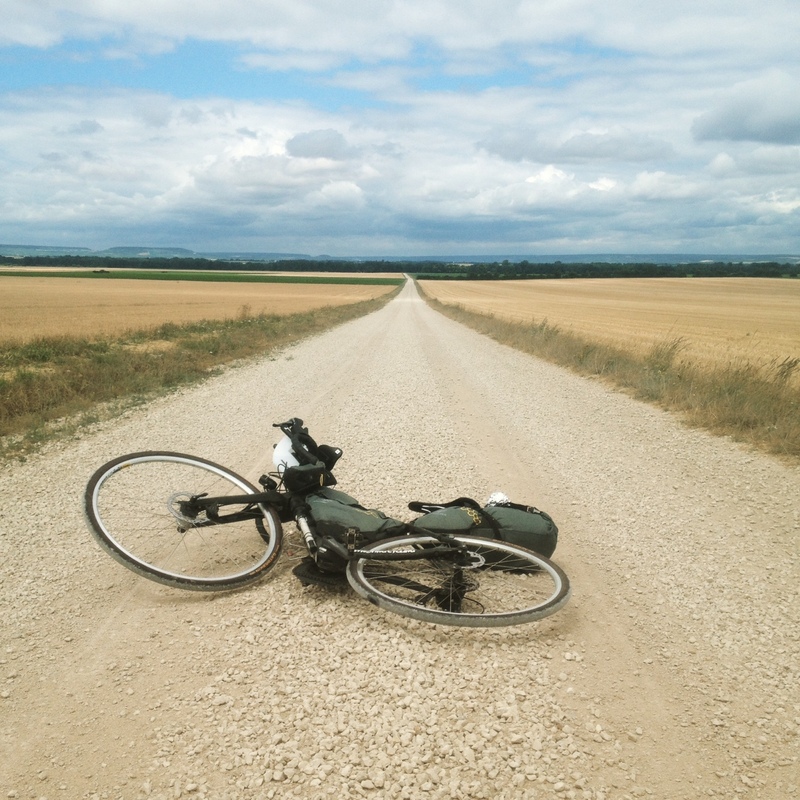 Quite far behind by now, I imagined, after my various detours, and having been significantly slowed down by the gravel. 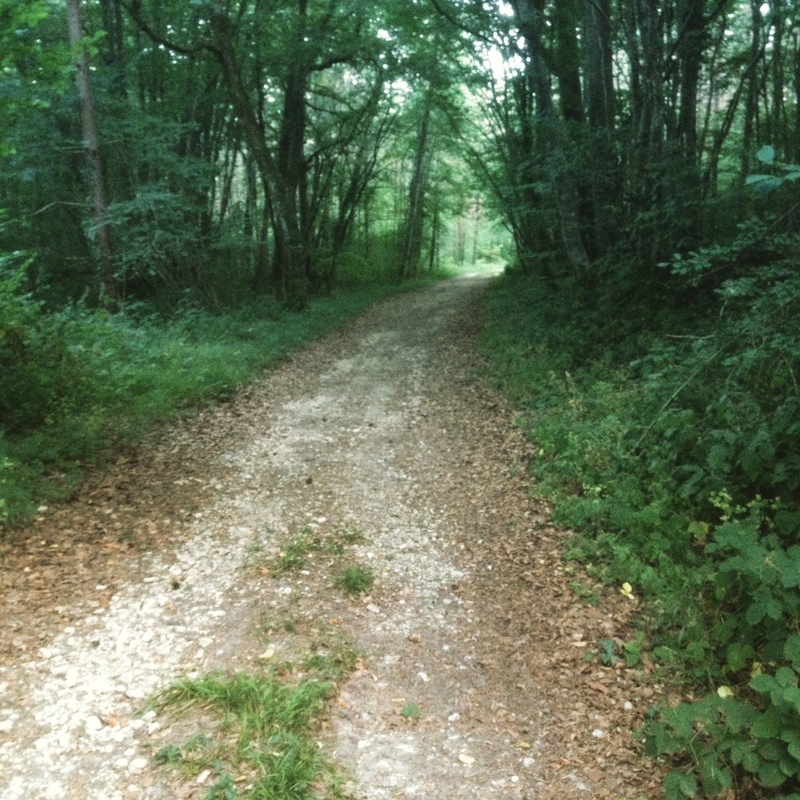 This pointless battle continued for an hour or so, as I flogged myself along the D444 towards Chaource, trying to appreciate the beautiful beech forest on either side of the road, but really wondering if it held any promising camping spots, and simultaneously telling myself that even if it did, there was no way I was allowed to stop now. I imposed myself on one of Chaource’s chic little cafes, drank an overpriced, undersized orange juice whilst trying to prop my head up and keep my eyes open, stretched, got back on the bike, and insisted to myself that I would at least ride until it got dark before allowing myself to sleep. 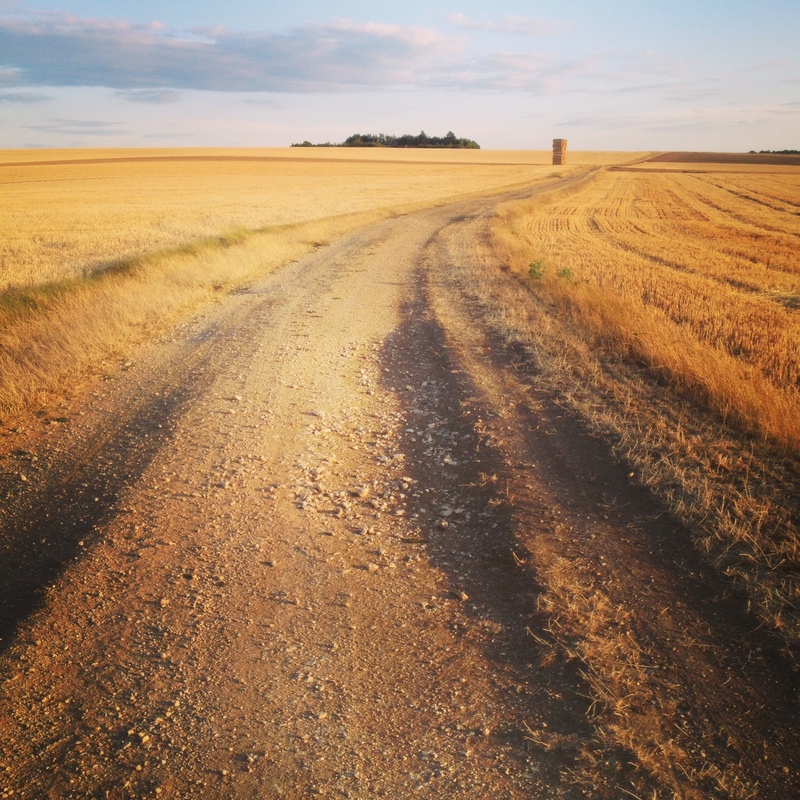 I followed my Garmin’s beeps through the remainder of Chaource and my heart sank as it led me onto yet another gravel road, meandering off into the golden farmland and the golden evening sunlight. But lacking the energy or initiative to stop and replan my route (and listening to one of the chattering voices in my head that told me every time I stopped pedalling that I was wasting time), I pressed on, the sleepiness gradually falling away, succeeded by a deep, patient tiredness, that told me I could go on all night, if I really wanted to. It’s a lesson I learn on almost every long ride I do, and then apparently forget and have to learn all over again on the next one, that no matter how exhausted you think you are, no matter how empty your legs, no matter how sincerely you believe that this is it, you’ll have to stop here, you can’t go any further – if you do go on, eventually this will pass, and everything will become wonderful again. My spirits rose as the shadows lengthened and I followed my gravel road up into the golden fields – and then they began to soar as the road became a stony track, and plunged downhill into an ancient wood, the green branches meeting above my head, birds singing all about me and startled deer and rabbits leaping out of my path. Once again the world – and the race – felt a very long way away. A few hours later, after emerging from the darkening woods and following a succession of roads and riverbeds and winding lanes into the quiet French night, I felt my eyes trying to close again, and knew that it was finally time to sleep. I found a patch of grass between some woodpiles on the outskirts of a tiny village, went through the brief business of eating, changing my shorts, unrolling my sleeping bag and setting my alarm, then lay on my back looking up at the stars above me, enjoying the feeling of my tired limbs settling into the ground, and savouring my last few moments of consciousness before I sank into slumber.